Custom Imprinted Allen Sunglasses are available in Brown, Dark Grey, Natural and Light Grey colors. Manufactured from polycarbonate materials, these custom new arrival sunglasses are made available with UV400 protective lenses to assure ample protection in the sun. They have a total dimension of 6" H X 1.25" D and are offering 0.50" H x 1.50" W imprint space to showcase your brand logo nicely. Order these custom printed Oahu sunglasses quickly to get free online proofs, free design and best price guarantee offers. 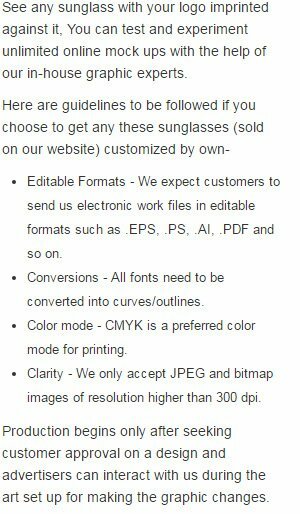 Request a quote to know wholesale savings for these Custom Imprinted Allen Sunglasses.